I am writing you the full story of a moment of interaction between Sasquatch… horses and myself. It begins to seem obvious that a ‘first’ visit from Sasquatch through the contact with our domesticated animals (in this case horses) is effortless on their part leaving signals like braids in the manes of the animals. At the end of January 2019, I was asked to do a transport of 4 horses ( 3 Frisian and 1 Dutch breed) from one city to another. We ( the owner and myself) agreed upon to do a collective transport, which would seem to be ‘less’ stress and ‘easier’ for the horses, knowing this horse family as being close with each other. I asked ‘my’ Sasquatch friend Yurrie the evening before the transfer to pay the herd a visit with the idea of creating a comfortable and safe travel from one place to another (for 1 horse-foal it was the first transfer). Sending these thoughts into ‘ether’ I went to sleep. The day of transport we arrived at the nature reserve (Belgium has plenty of little areas, cut off parts of land, forests which are protected by ‘Natuurpunt’) were the horses- who live mostly outdoors- had been grazing for quite a while. Arriving on the meadow, I was eager to check the condition of the animals, so as soon I came nearby I noticed braided manes with 2 of the Frisian horses ( Frisian black horse grows long hair in neck and tail). 1 braid each horse as I noticed carefully. At that moment I decided to focus on the transport and come back later to examine the braids myself. In the evening as I arrived at home rethinking the braids, I thanked Sasquatch clan for their co-operation, remembering asking the question why 2 horses each got 1 braid. I left the thought and got to bed. Couple days later I went to visit the same herd to check on the braids. I was amazed finding 3 braids with the stallion and still 1 with the mare which points out ‘Yurrie must have picked up my internal questioning, or/ and perhaps the stallion needed more Sasquatch-interaction…comforting after the transfer? He was nervous, anxious with the loading on the trailer the day of the transfer. Inspecting the plaits I saw an intricate pattern of twisting, weaving, curling and looping of hairs into a tight braid/ sometimes knot. Some had loops while others were just weaved together. ( see pictures, short clip). 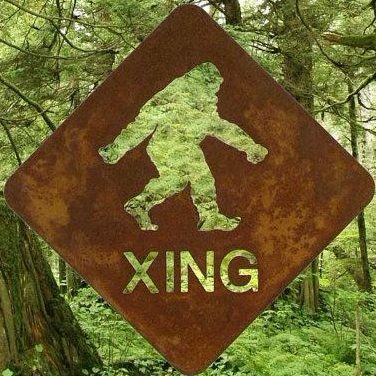 Grateful for the interaction from the Sasquatch people.